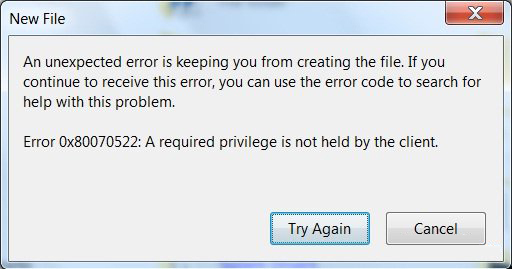 If you are unable to update your Windows Computer or PC due to the Update 0x80070522 Error “Privilege Not Held” then you are at the right place. In this tutorial we will learn how to get rid of Windows 10 Update 0x80070522 Error “Privilege Not Held” and update the system with ease. But, before applying any fixes to overcome from this Windows 10 update, it is suggested to know about 0x80070522 “Privilege Not Held” Error. An unexpected error is keeping you from creating the file. If you continue to receive this error, you can use the error code to search for help with this problem. Now coming to the point, you should follow the below-given solution one by one in order to fix Windows 10 Update Error 0x80070522. First, open the run dialogue box. Press Windows and R button. In the run box you need to type msc and hit Enter key. If any confirmation window will appear then click on the OK. This will open up the Local Security Policy Now, you need to navigate to the Local Policies present at the left pane and click on Security Options. At last, click on the Apply and then OK to save all the modifications. Now exit from the Local Security Policy window and restart your device. After disabling admin approval mode, try to update your PC or laptop. To do this first you need to right click on your system drive (generally c driver) in File Explorer and choose Properties. Navigate to the Sharing tab and click on Advanced Sharing button. After opening Advanced Sharing window, check Share this folder and click on Permissions. In the permissions window, you should verify that Everyone is listed under Group or user names section. If it is not then, click Add and type Everyone, choose check names and then click OK. After it, check Full Control, Change and Read options to provide full control to ‘Everyone‘. At last, click OK then Apply and exit from the File Explorer. Reboot the File Explorer with the help of Task Manager and verify the status of the issue. Note: It is suggested to don’t do any kind of manipulation over registry database as a small mistake while manipulating with registry database could affect your system badly. That’s why it is recommended to create a System Restore point before. Press Window + R to open the run dialogue box, type regedit in the Run box and hit Enter key to open the Registry Editor Window. If any confirmation window appears, then click on the OK.
Now you need to change the value, go to the Edit DWORD Valuebox, set the Value data as 0 and click OK. Exit from the Registry Editor Window and restart your PC. After applying the above-given steps, the issue should be fixed. First of all make sure that you are logged in as the administrator, in case you are logged in as guest or user then logout and again login as administrator. After it, you need to visit the Microsoft website (https://support.microsoft.com/en-us/help/12387/windows-10-update-history) and download the official Update Assistant. To download, click on the “Get the Anniversary update now” button. After downloading Update Assistant run the downloaded file. Click on the “Update now” button. In this window you will see the three categories – CPU, memory and disk space checkmark all -> click “Next” and the update will start to download. After downloading you will get a window with a notification and a countdown timer to automatic restart. Exit from all other programs and click on the “Restart now” button. Your PC or laptop will restart several times and at last a screen will appear with the user login screen. After selecting the administrative account, another screen will appear with several new privacy features. You can change them according to your requirement, click on the “Customize”. Or, click “Use Express settings”. Go to the Privacy section, and scroll down and turn off the options. After it, click on the “Next”. At last, you need to check the three browser security settings, leave them active. Click on the “Next”, you can change these three sets of choices later on from the Windows 10 Settings app. After few seconds your Windows 10 will boot with an updated operating system. But sometime after installing any latest update PC/Laptop become slow, to avoid this problem you should scan your Updated Windows System with a professional PC Booster tool. This software is designed to deal with all those issues which are affecting the PC performance. It is very effective and also able to get rid of all other types of PC errors like DLL error, registry error, driver related issues and more. Apply the given solution one by one in order to Fix Windows Update Error 0x80070522 without need of any professional skill.